Rovers celebrate a goal against Chorley. 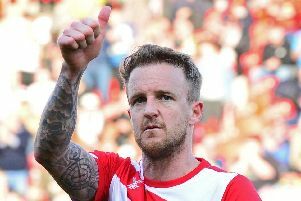 I am still only cautiously optimistic about Doncaster Rovers finishing in the top six – and I will explain why here. Before a ball was kicked this season I predicted a mid-table finish but hoped to be pleasantly surprised. Grant McCann’s boundless positivity and his no-fear brand of football have provided a very welcome breath of fresh air. But his all-out attacking approach does appear to have certain limitations – notably the shortage of clean sheets and the recent problem of going behind in games. You could argue that Rovers’ current position in the League One table, seventh, is about par. It’s probably about where they should be, especially when you recall what chief executive Gavin Baldwin said about the club’s ploy to continually position themselves with ‘the six or seventh best budget’ in the division. Finishing in the play-off positions will require some of the major issues to be ironed out. McCann has not been shy of big statements and his assertion, following Saturday’s 1-1 draw at Barnsley, that his team is ‘one of the best in League One’ was certainly backed up by the superb performance at Oakwell. But results over the course of the season tell a slightly different story. Rovers also gave Portsmouth, Sunderland and Peterborough United a very good run for their money but the fact remains that they have only beaten one team in the top six – Luton Town. Results have been patchy. Wins have arrived in clusters. That suggests to me that the high intensity that Rovers play at may cause them to crash and burn – possibly physically and mentally – when things start going against them. On their day this Doncaster team is capable of turning anyone over in League One. Tuesday night’s professional job against a well organised Blackpool team was evidence of that. But can they last the course? Can a relatively small group of players play at such high intensity for 46 games? The answer to the second question, undoubtedly, is no. The performances at Burton, Coventry and Charlton back that up. So for Rovers to improve on seventh they need to find other ways of winning than simply out-pressing and out-working the opposition. They are going to have to grind out more wins, particularly over the winter months, like they did against Luton Town and Rochdale. They are going to need to defend more doggedly and keep more clean sheets – something they are yet to do in an away game this season. They are going to need to take more chances in front of goal. And they don't just need to strengthen in January but also hold onto what they have. Herbie Kane has been nothing short of sensational and his high octane style rather personifies this team. Keeping him beyond January could prove to be pivotal when it comes to the play-off push.